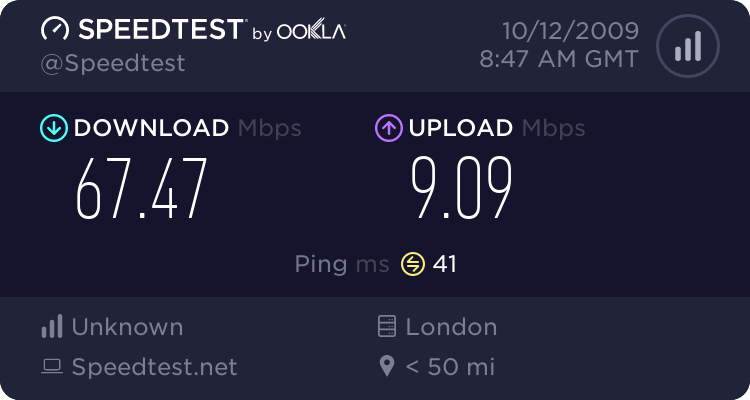 I just ran a speed test at my school and I was surprised! so i did that test and the results were better than i thought. It just shows there are no problems local to you. Sometimes it can be a problem close to where you access the internet. 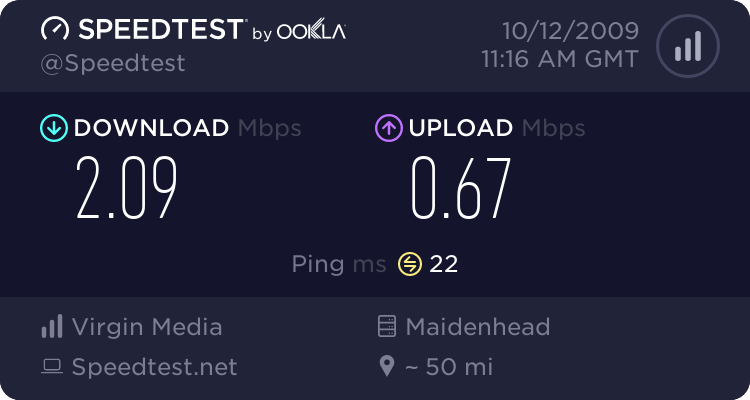 This could particularly be an issue for Virgin Media as they don't connect directly to the internet but rather go through the cable network and then thousands connect at the same place. 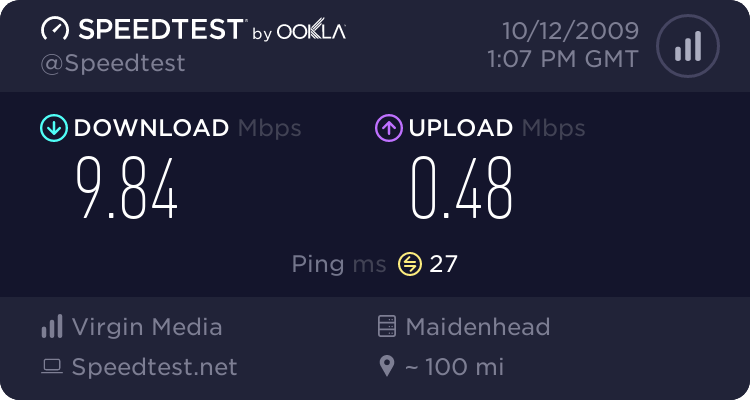 If there is a problem with these servers or another data centre close by then you could get a bottle neck which would strangle your speed and increase your ping. Hard wire your computer to the router. 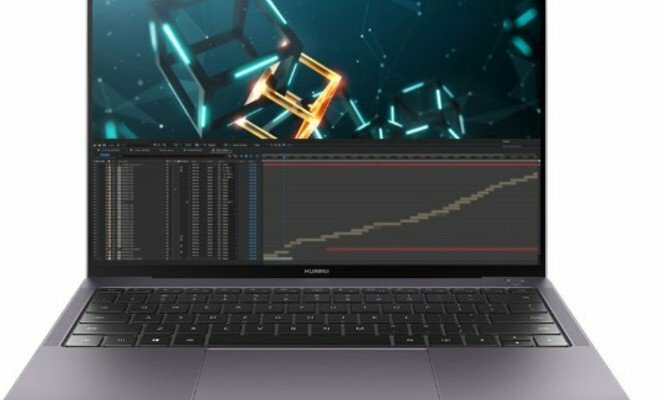 If your speed improves when you do that then you know that it is the router, however most laptops and consoles only support G so N is somewhat redundant unless you are using multiple devices. I have the N router and it is great. I can stream 1080p from the PC to the PS3, whether this could be done on a G router i don't know, but the PS3 only supports G.
It would work on a G router because although your N router will broadcast at 300Mbps, your PS3 can only receive 54Mbps. The reason why I was wondering if it's worth me getting an N adapter for my PC is that my signal strength is only 12-24Mbps, but it usually jumps around 12-18, so if my signal isn't even 20Mb then I won't get that. The thing that is most worrying though is that I don't even get 12Mb on a speed test. 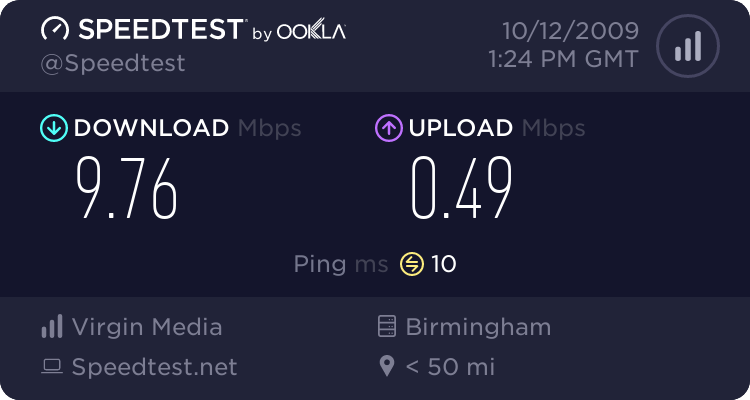 Granted this is during the day, but when we first got the package (about 2weeks ago) we got 12Mb/ 16Mbps and it's gone down hill from there. To the people getting what they're paying for on VM, are you downloading lots? Kind of annoying because we signed up to the 20Mb package and aren't even getting 10Mb speeds! Your all lucky the best i can get is 500kbs and thats on a good day! I don't download that much but from time to time i use it quite heavily. I would say my internet traffic is about 500mb - 1gb per day on average. I have the wireless router on the highest signal strength setting because there are no other local wireless networks and as i said before it works great. I never get any drop outs. Yeah, is there anything I can do to get VM to improve my speeds... I've taken a look at the upstream/ downstream DB levels to see if anything is too high and it all looks fine, which is annoying, because VM will probably say the same. 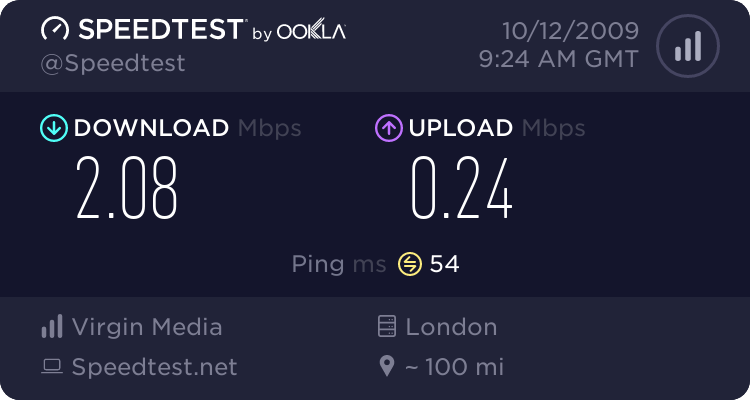 I'm starting to think that perhaps it is the server I am connecting to on speedtest or something - I just downloaded a file and it was going at 800KBps, and occasionaly jumping up to 1.35Mb. don't think i even pay for 10mb..
mine is like 2.5, 0.5. 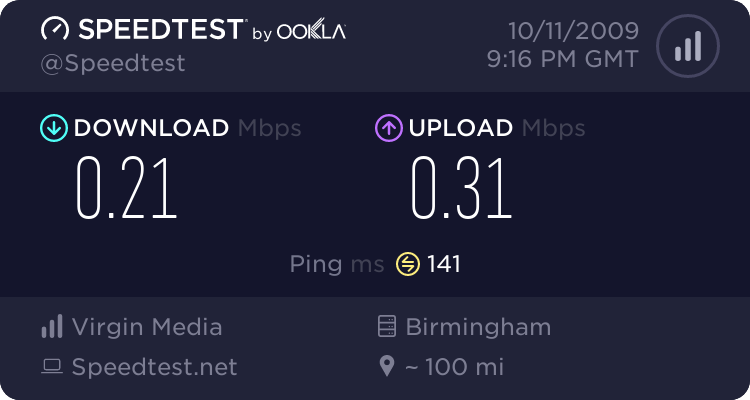 We're paying for 20 from BT. They're bloody scum. 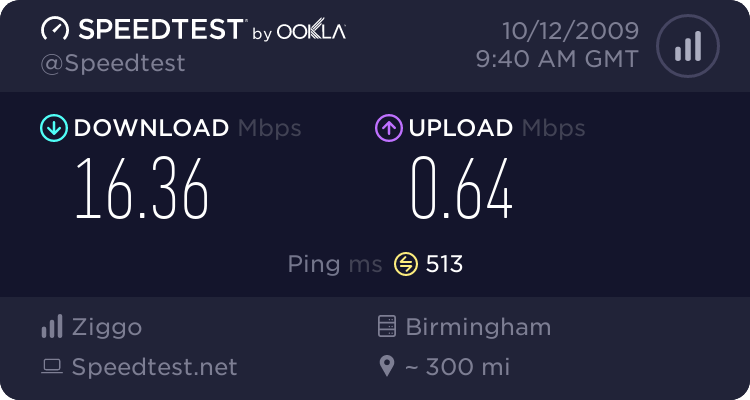 and to add to that, they stalked me on twitter, 'BTCare' are now following me and tweeting at me, suggesting that I get their unlimited package and asking me to send them results of a speed test. grr. *******s.
I'm paying for 10MB service, so what the hell? Have a look at Be. Up to 24MB for £17.50 per month. 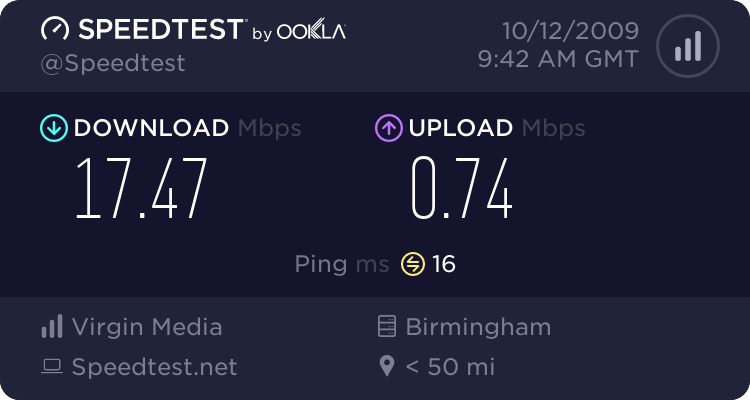 It's extremely reliable, quick to set up (ordered on Sunday afternoon, was up and running on Tuesday afternoon), and you get the best speed available, without throttling. 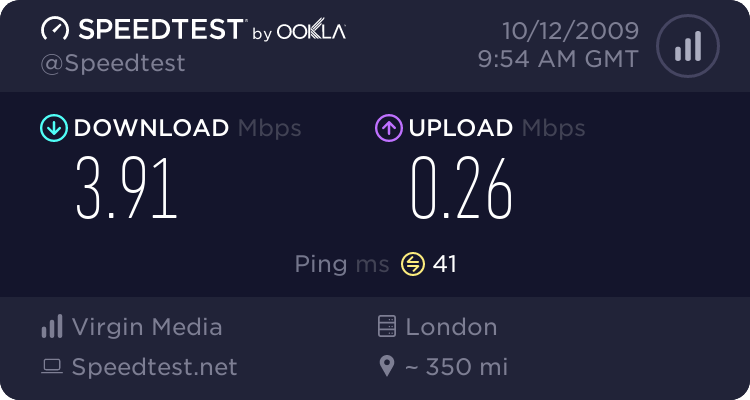 Distance from the exchange and other factors affect speed, but usually not too much - my speed is around 21MB (in real terms - I've tested it). If you're worried about reputation etc., just Google them (they've won several ISP awards). 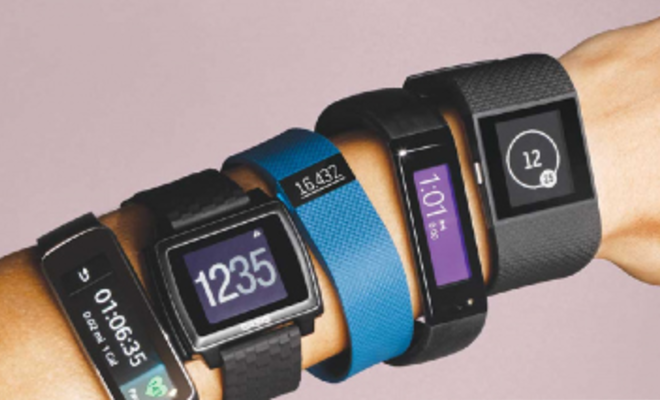 They're owned by Telefonica/O2 - so it's not an untrustworthy company by any means. On that note, O2 broadband is almost identical, and that could be cheaper if you have an O2 contract. 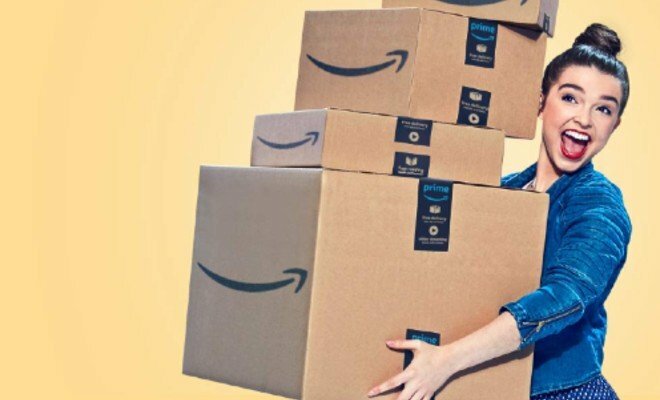 It is only £125 pounds if you have previously been disconnected for non-payment or if they need to do stuff in your house. If it is just a matter of reconnecting an existing phoneline it costs nothing. 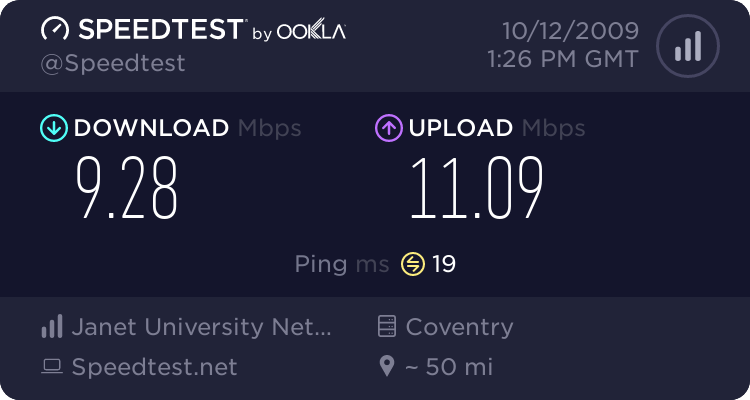 What broadband deal for student house? Which broadband provider should I choose as a student? How often does your broadband stop working?